I graduated from Vincennes University in 1993 with an Associate Degree in Machine Trades Tool and Die. Since then I have been working as a machinist. I married my high school girlfriend, Kristen Vinardi, June 17, 1995 and we are still happily married (we've been together since August 1990). We have 1 child, our daughter, Koti Michelle, born August, 1997. She attends West Vigo Middle School. Kristen and I coach Koti's softball team and attend all her sporting events (soccer, basketball, track, softball). Koti is also a member of the WVMS band and concert band where she plays the flute. Love being a dad. Sept, 2007, we finally moved back to the New Goshen area where we grew up(had been living in Terre Haute for 12 years). Lovin it out here! I enjoy riding the 4-wheeler, cooking out on an open fire, hunting, traveling, and my family and friends. CHAD YORK has a birthday today. 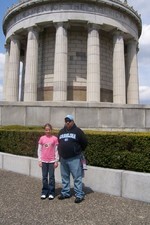 Me and Koti on her 4th Grade field trip to Vincennes, May 2008. My beautiful family! We are getting ready to take Koti to the Snowflake dance at Fayette. Her first dance! Koti at Table Rock Lake, Branson, MO July, 2009.